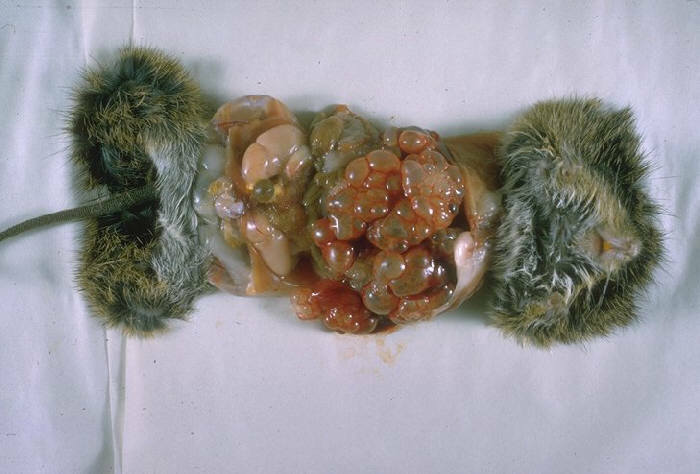 English: Gross pathology of cotton rat infected with Echinococcus multilocularis, a species of cyclophyllid tapeworm. First E. multilocularis isolated in the United States proper. Necropsy. Čeština: Pitva krysy bavlníkové (Sigmodon hispidus) infikované tasemnicí Echinococcus multilocularis. První identifikovaný případ na území Spojených států amerických. This media comes from the Centers for Disease Control and Prevention's Public Health Image Library (PHIL), with identification number #335. Note: Not all PHIL images are public domain; be sure to check copyright status and credit authors and content providers.